Reading and share top 12 famous quotes and sayings about Worrying About Future by famous authors and people. 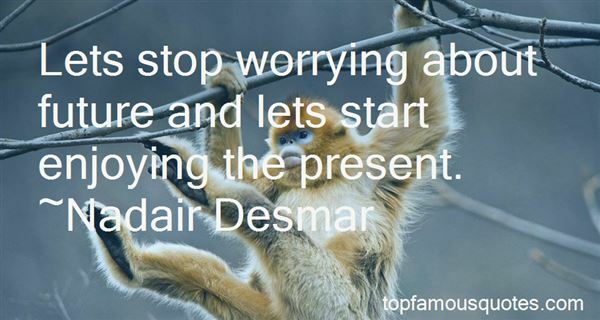 Browse top 12 famous quotes and sayings about Worrying About Future by most favorite authors. 2. "If we should be worrying about anything to do with the future of English, it should not be that the various strands will drift apart but that they will grow indistinguishable. And what a sad, sad loss that would be." 3. "The fact is if we do our job right, if we keep worrying not about polls but about the jobs of the American people, about their health care, about their ability to educate their kids, stay in their homes and own their homes, send their kids to college, the basic pillars of a middle-class life, if we keep worrying about the future and building a stronger future for this country, these things will take care of themselves." 4. "Make a conscious effort to live in the present today. When you catch yourself obsessing over the past or worrying about the future just remember you are exactly where you need to be right now." 5. "Our past cannot be changed, and to be preoccupied with it is inefficient in time and effort. Likewise, by fretting over the future, we only exhaust ourselves, making us less able to effectively respond when the future is actually upon us. By worrying about a mishap that may or may not take place, we're forced to undergo the event twice—once when imagining it and once again if and when we actually experience it." 6. "Basically, if the mind stays in the present, it's impossible to worry. Upon careful consideration, it becomes clear that human beings are capable of worrying only about an event that has already transpired or one that may take place in the future (although the occurrence might have just happened or may be about to happen in the next instant). The present moment contains no time or space for worry." 7. "How strange and foolish is man. He loses his health in gaining wealth. Then, to regain his health he wastes his wealth. He ruins his present while worrying about his future, but weeps in the future by recalling his past. He lives as though death shall never come to him, but dies in a way as if he were never born"
8. "Rather than having regrets over events in the past, or worrying whether or not the future will bring you what you need or desire, allow yourself to rest in the present, the now. Understand that all that has transpired has brought you to this moment, and in this very moment, riches that far outweigh those of the world already lie within you." 9. "It is a time when one's spirit is subdued and sad, one knows not why; when the past seems a storm-swept desolation, life a vanity and a burden, and the future but a way to death. It is a time when one is filled with vague longings; when one dreams of flight to peaceful islands in the remote solitudes of the sea, or folds his hands and says, What is the use of struggling, and toiling and worrying any more? let us give it all up." 10. 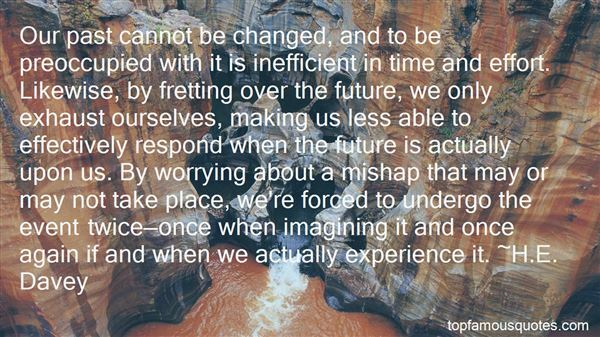 "Lets stop worrying about future and lets start enjoying the present." 11. "One must simply take the days of their lives as they happen. If you spend time worrying over what is to come, which may or may not happen, then you will only be wasting precious days you will wish in the future you could have cherished a bit longer." 12. "By late afternoon I lie with my head in Peeta's lap making a crown of flowers while he fiddles with my hair claiming he is practicing knots. After awhile his hands go still."What?" I ask. "I wish I could freeze this moment, right here, right now, and live in it forever," he says.Usually this sort of comment, the kind that hints his undying love for me, makes me feel guilty and awful. But I'm so relaxed and beyond worrying about a future I'll never have, I just let the word slip out. "Okay," I say.I can hear the smile in his voice. "Then you'll allow it? ""I'll allow it." A red-tailed hawk rose high on an air current, calling out shrill, sequential rasps of raptor joy. She scanned the sky for another one. Usually when they spoke like that, they were mating. Once she'd seen a pair of them coupling on the wing, grappling and clutching each other and tumbling curve-winged through the air in hundred-foot death dives that made her gasp, though always they uncoupled and sailed outward and up again just before they were bashed to death in senseless passion."